'is not so much a story of 'the journey so far' but more a snapshot into what a typical week is like for the authors and contributors to the book. This documentary is testament that it is possible for a hopeless dreamer to dream in 'flights of fancy' but yet have his 'flights' for his singular critic'. In the documentary Bobo Omotayo talks about his upbringing and background. His interesting childhood - 10 years in Nigeria, 10 years in London, and 10 years back in Nigeria - and how it has influenced his writing. He wanted to create a book that gave 'digestible bits of information'. For Bobo Omotayo, the book 'is a celebration of the best possible minds that I know'. I have to say I loved seeing the graphic designer, photographer, illustrator, and pop-artist (and a some of their works) behind the book. He ends with saying that while London Life, Lagos Living is 'his own story', it's also 'a story of a lot of us'. His inspiration being Nigeria, there's nothing in the book no one can relate to. 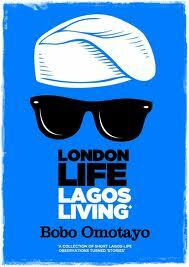 London Life, Lagos Living: The Documentary was directed by Nigerian/British filmmaker, Francesca Tilley-Gyado (she is based in LA). I absolutely loved the way it was shot. Enjoy!